Like a boxer’s characteristic one-two punch, the Women’s 5K Classic and EXPO, seeks to deliver a knockout blow to the #1 most common cancer to be diagnosed among women: breast cancer. 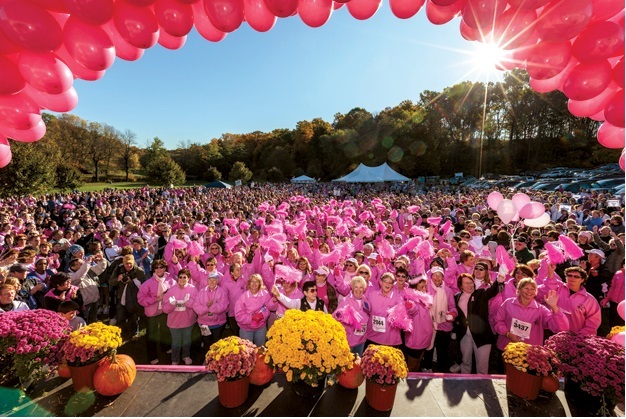 This multi-day event began back in 1993 by a community leader whose mother had received the life-changing diagnosis of breast cancer. Event founder Wendy Body walked along with some 250 other participants that year, and together they raised over $2,500 for the cause. “Wendy wanted to do something positive and decided to reach out to her friends and start a race that promoted health and fitness and at the same time raised funds that would remain in our Lehigh Valley,” says race committee member Jane George. Since its inception, all funds raised at the Classic and the EXPO have gone directly to support those diagnosed with breast cancer locally. More than 5,000 participants registered for last year’s event alone. October 16-18, 2015 — Back by popular demand this year is the addition of The PINK 16.2 Running Event, which is co-sponsored by Runner’s World, and is actually a half-marathon (13.1 miles) tacked on the next day for runners who seek an even greater challenge. As has been customary, the EXPO, which seeks to help empower and educate women in matters of health and wellness, will be held the day prior on October 16. The 2015 Josh Early Candies Women’s 5k Classic Health EXPO will be held at St. Luke’s West End Health Center in Cetronia. The EXPO does an awesome job of combining educational opportunities with activities that are fun and informative, like healthy cooking classes, boutique shopping, chocolate sampling, mini facials and more. The EXPO has certainly helped get participation up there, as has the reality that nearly everyone knows someone affected by the disease or has battled it themselves. Since 1993, more than $2.5 million has been raised and that money has stayed here in the Lehigh Valley. It is true there is strength in numbers and the good news is some of the numbers associated with breast cancer are getting better. “Each year the number of survivors grows and the number of years that our friends and sisters survive increases,” George says. And that’s an achievement that everyone who puts sneakers to the pavement can be proud of.